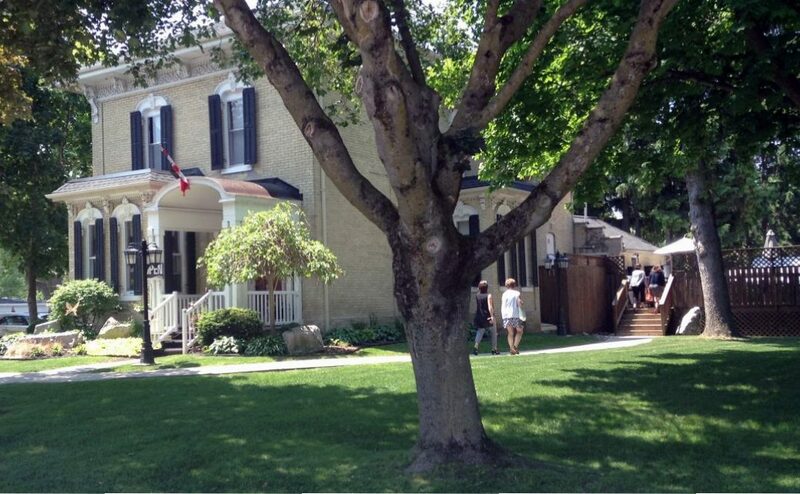 EDDINGTON’S OCCUPIES THE ORIGINAL CARLING HOMESTEAD, BUILT IN THE LATE 1870’S.THE HOUSE WAS PURCHASED BY WILLIAM AND MAUDE MAY AT THE TURN OF THE CENTURY. THE ITALIANATE STYLE OF ARCHITECTURE. 12’ CEILINGS BOTH UP AND DOWN STAIRS. MAUDE’S SPIRIT IS STILL KNOWN FROM TIME TO TIME TO WATCH OVER THE HOUSE ANDOUR GUESTS. CONVERTED INTO A RESTAURANT IN THE MID 1980’S, BY ROBINDALES; MADE ITS MARK AS A CULINARY DESTINATION. EARLY 90’S – SOLD TO CHEF MICHELE WHO OPERATED IT AS THE FRENCHMAN’S INN, BECOMING RECOGNIZED AS A” WHERE TO EAT, CANADA” RECOMMENDED VENUE. 1997 – EDDINGTON’S OF EXETER WAS ESTABLISHED.AFTER TWO MAJOR RENOVATIONS, THE RESTAURANT HAS A CLEAN MODERN LOOK WHILE IT MAINTAINS A TRADITIONAL, YET WARM FEEL.A SERENE OUTDOOR BACKYARD PATIO IS A MUST FOR THE SUMMER. OWNER/CHEF JAMES EDDINGTON STATES THAT “WE ARE BLESSED TO BE LIVING IN SUCH AN AGRICULTURALLY RICH AREA OF THE WORLD.” HE ATTRIBUTES THE RESTAURANT’S SUCCESS IN CREATING FLAVORFUL AND CREATIVE MEALS TO BEING ABLE TO CONSISTENTLY USE THE BEST OF HURON COUNTY’S BOUNTY. ALTHOUGH THE LOCAL FOOD MOVEMENT IS REALLY STARTING TO TAKE OFF, IT ALWAYS HAS BEEN THE DRIVING FORCE IN EDDINGTON’S KITCHEN. A MENU THAT CHANGES FREQUENTLY, AS EACH SEASON INSPIRES US WITH THE DELICACIES OUR REGION HAS TO OFFER. NOW CELEBRATING OVER 20 YEARS OF BUSINESS. WE ARE PROUD TO HAVE BUILT A GREAT RELATIONSHIP WITH OUR REGION’S FARMERS, SUPPLIERS AND PRODUCERS. EDDINGTON’S BELIEVES THAT DOING BUSINESS LOCALLY, YOU NOT ONLY GET PERSONAL SERVICE AND REAL VALUE, YOU ALSO STRENGTHEN YOUR LOCAL COMMUNITY AND ECONOMY.